Not much more to say, except you must try this. Rinse thoroughly each piece of chicken and place in a large bowl or container, cover with cold water and let sit for at least 15 minutes while you get the rest of the ingredients ready. In a pan safe for frying chicken, pour oil to a depth of at least 2 inches and heat the oil over med-high heat. In a large paper bag or large zip lock type bag, place all the rest of the ingredients and mix well. When a little cube of bread sizzles in the heated oil, it is ready for the chicken. One at a time, place a piece of chicken in the bag, close over the top and shake to coat the chicken, then carefully place in the hot oil – do this with about 4 pieces at a time so as not to overcrowd and watch it carefully so oil doesn’t bubble up over the sides of the pan. 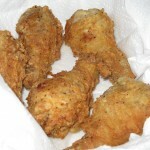 I usually fry the drumsticks, thighs and wings first then I fry the breasts in the second batch. 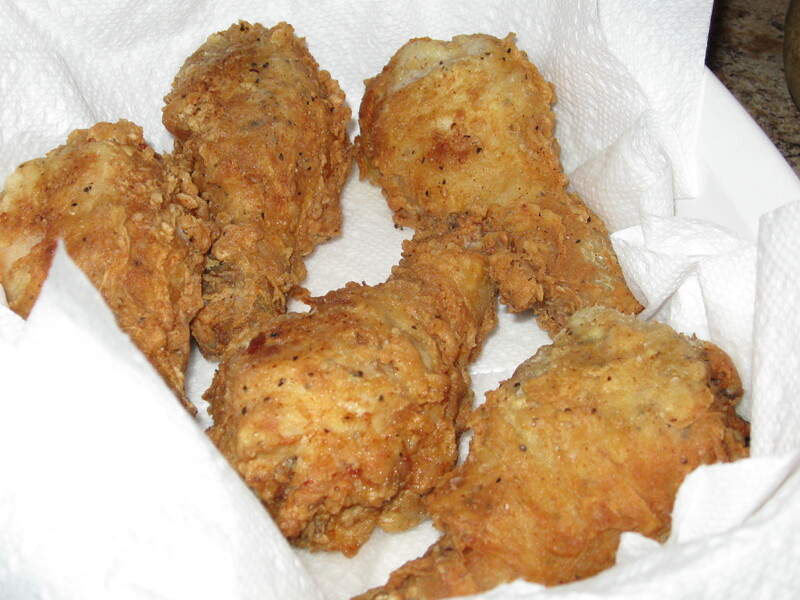 Fry chicken pieces until golden brown, about 15 minutes on each side, may even take longer for dark meat or larger pieces or until done – turn only once during cooking. Remove with tongs and place on paper-towel lined pans or even use brown paper bags.